Our holiday weekend started out pretty normal. J was pregnant and her due date was actually on Thanksgiving. Not knowing what would be going on with the baby, we opted to forego the traditional holiday meal with family. We decided to take L to a movie instead. Alamo Drafthouse was open, so we did a noon showing of The Good Dinosaur and ate our lunch at the movie theater. A few hours after we got home, our holiday got a little less normal. J got a call from the hospital asking her to come in for a couple of tests and we ended up staying and having a baby! Our son was born just after 10:00 on Black Friday. On Sunday, J was looking for some real food. The previous two nights, we had eaten Jimmy Johns and Penn Station for dinner. J wanted Panera. I really didn’t, but I was going to get her whatever she wanted. I was kind of in the mood for Mexican and I knew I was going to be passing one on the way to pick up J’s meal. Mi Pueblo Mexican Restaurant is on Gull Road across from the old Nazareth campus near the intersection with Nazareth Road. The small Mexican place is in a strip mall next to a Curves and Route 66 Technologies. I called in my order on my way to the parking garage at Borgess Medical Center. They had just opened a few minutes prior to my leaving for lunch, so I wanted to give them time to get things going. My order was simple. I was just looking for a few tacos and some chips and salsa. I ordered a la carte and got four steak tacos with corn tortillas plus a small order of chips and salsa. I was told it would take about twenty minutes, so I headed down to Panera to get J’s lunch before heading back to Mi Pueblo to pick mine up on the way back to the hospital. It took a little more than twenty minutes for me to get back to pick up my food. The cost for the four tacos and chips was right around $10. I paid cash at the counter right inside the door then headed back to the hospital to eat my lunch. I started with the chips and salsa first. Both were homemade. The chips were those puffy type of deep fried tortillas with quite a bit of salt. The salsa with a very thin, very fresh salsa that was a little too onion heavy for my liking. Didn’t stop me though. 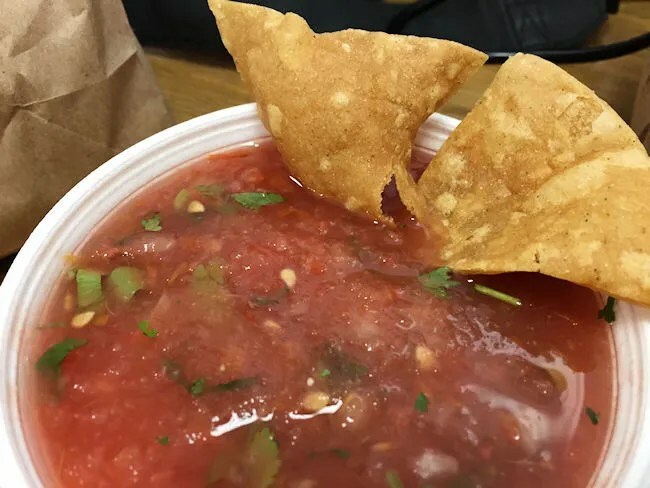 I still ate all the chips and and about half of the salsa. The tacos were a little interesting. The menu I could find online didn’t say what came on them and I didn’t ask. It was kind of a cross between a Mexican taco and an American taco. The very tender, flavorful meat was topped with lettuce, cilantro, onion, and tomato. I typically just like my tacos with meat and cilantro, but I could deal with these. I pulled most of the veggies off because the meat was actually pretty good on it’s own. 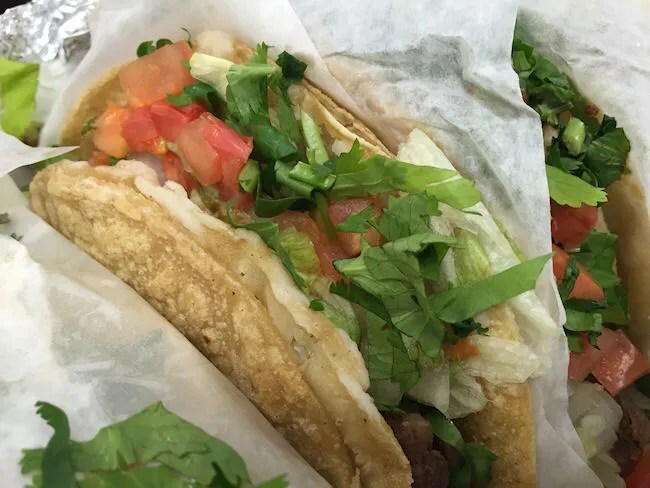 I just found it interesting that the taco was a combination of two styles and not one or the other. 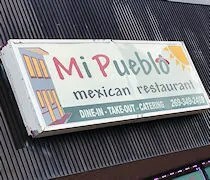 Mi Pueblo is one of those places that I’ve driven past many, many times and just never stopped. 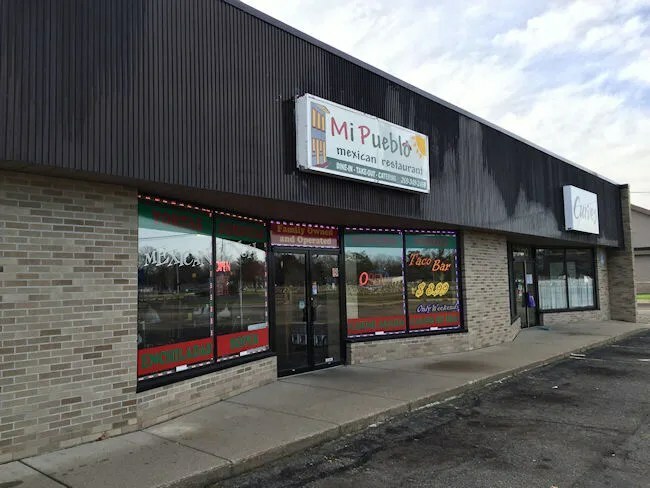 There are a lot of Mexican places that are exactly the same and while Mi Pueblo doesn’t exactly stand out from anything else I’ve had in town, it did deliver a very tasty and hearty meal. I was craving Mexican and just really, really wanted some good tacos. I got that at Mi Pueblo.